There are very few books on fishing that I have looked forward to reading as much as this one. Ted can hardly be accused of being a prolific writer, but his book Irish Trout and Salmon Flies is a classic and it has the distinction, denied to the majority of angling books, of having run to a second edition and also of appearing in paperback. While his first book was very much a dictionary of Irish dressings, Tying Flies in the Irish Style has much more detail about how to tie the patterns. Given the idiosyncratic methods that many Irish flies use, the appearance of a work like this is not before time, and I am sure that it will find a ready market among beginners and experts alike. The first half of the book is dedicated to a discussion of the materials and methods used to tie Irish patterns. Ted is not shy of including ‘modern’ methods like Martin-style dubbing loops; it is refreshing to see this sort of open-mindedness in a work on what are largely traditional patterns. There is an all-too brief section on dyeing materials and it would have been good to see this expanded, as information about this subject is hard to find and it can seem more like alchemy than science to a baffled beginner. All of the patterns are beautifully illustrated in colour and many of them accompanied by hand-drawn tying illustrations which must rank among the best I have ever seen. Then, in an eclectic turn which characterises this magpie’s nest of a book, the final third of the work is devoted to selected works of Tommy Hanna of Moneymore and angling letters written to this famous Irish fly dresser by G.E.M. Skues. 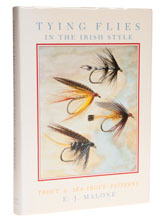 Definitely one for the fly-tying shelf - and also take a look at Irish Trout and Salmon Flies by the same author.